A&W Root Beer has a long history of helping my family create some beautiful memories. When I was a child, we got to make root beer floats on our family fun nights. Now, I might give away my age when I tell you our movie nights were in the age of no cable TV. But, on Sunday night, "The Wonderful World of Disney" was on TV and we were allowed our special treat of the week, an A&W Root Beer float. We would watch in awe of the great movies and Disney specials while we sipped our floats.The unique, creamy taste of A&W Root Beer is a simple treat that creates fun, care-free experiences for families and can help make any moment special. I loved being able to make my own float. My Mom would make sure we had all the ingredients to make these nights special. 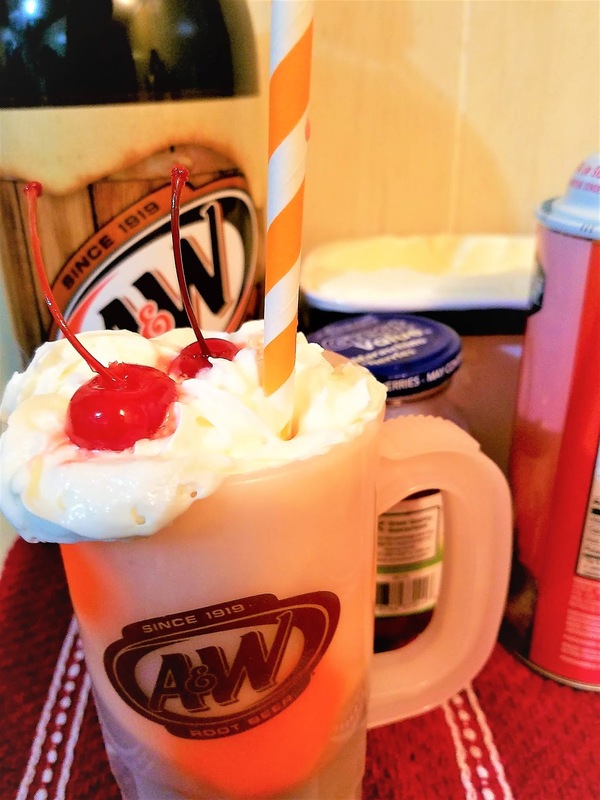 Vanilla ice cream, whipped cream and cherries, along with the creamy taste of A&W root beer were set on our kitchen counter. Making an A&W Root beer Float is as simple as it comes! Pour A&W Root Beer in your favorite glass or mug until it is about 3/4 full and then a scoop of ice cream. Top with whipped cream and of course, the cherry on top. Insert a straw and sip away! Now, you can top with as many ingredients as you like: colored sprinkles, nuts, cookie crumbs, and flavored syrups. The possibilities are endless. Personally, I just enjoy the traditional A&W Root Beer float! As a child, there were not many times we were allowed to make anything in the kitchen. But,we looked forward to those weekly A&W root beer floats. Not only was it our only indulgence, we looked forward to it all week. I have two sisters and Mom and Dad would pick who got to go first each week. After making our floats, we would gather round and watch TV and sip on our floats. Those are some great memories when times were simple. I have carried this tradition on with my kids and now my grandchildren. I let the kids pick out what movie we are going to watch and we make our A&W root beer floats, just like I did many years ago. I hope my children and grandchildren will continue this tradition for many years to come. For “float how-tos” and recipe inspiration visit, www.rootbeer.com. Oh yeah, I remember having A/W root beer floats...such a good memory too. I haven't had one in so long, that picture alone makes me want to go to the store and get the ingredients....so good...I know that it will live up to the memory too.